In the process of freight shipping, pallet delivery is a good way for business to save money and energy. The pallet was originally designed for transportation, helping to import and export a variety of international goods. Many enterprises use pallets as a safe and reliable way of freight shipping from China, which can prevent the consignment from being damaged in transit. Because of the simple structure and effectiveness of the safe mode of transport, goods can be transported safely. With the ease of pallet handling and product transport, pallets are becoming increasingly popular and are being used worldwide. I hope this article will help you understand the pallet delivery. Pallet printing is the process of packaging and storing products together and loading them into a unit on a pallet for storage or transportation. A pallet is a flat structure for storing goods, allowing the goods to be transported in a simple and efficient manner. The goods are usually placed in the delivery tray and are contracted and bundled to ensure their safety. There is a gap between the bottom and the top of the pallet. This helps the forklift to insert the forklift nails and then lifts the pallets and cargo up and moves them short distances. This makes it easy to load and unload pallets at the starting and finishing points. Mechanical handling pallet can be carried out easily and safely, saving time and greatly improving productivity and efficiency. Staff do not need lifting heavy products，so pallet help reduce the risk of injury or injury in the workplace. Therefore, in some port of destination, LCL goods are required using pallets. What Cargo Can Pallet Delivery Can Ship? The range of items that can be transported on pallets is quite surprising. A variety of goods, from appliances, furniture, motorcycles, building materials and small boxes, are suitable for pallet delivery. Using pallets to delivery bulky items is a very useful way to save time and cost. 1. The First Benefit Is Cost-Effectiveness. Depending on how much you want to export or import, you can cooperate with shipping companies by sea freight or by air freight. When you need to transport large quantities of goods, you will get a significant economic advantage through pallet delivery pricing. If you have experience in shipping industry, then you know that the usual practice is to receive most items of standard carrier pricing. This pricing method is based on weight and the type of goods to be shipped. It lowers operating costs. 2. Pallet Delivery Provides Better Moving Convenience. Most companies will ship the same products daily or weekly. When they are transported on pallets, they move more easily, allowing them to carry their products with pallet forklifts. This is very useful, and the goods can be easily monitored to move products more easily. 3. Provide Better Protection Against Damage. No matter what products are shipped, pallets can help to compact products to improve security, reduce excess space for products, and help prevent damage during transportation. Pallet packaging not only ensures that your goods are tightly connected to each other, but also to the pallet itself. Made of wood or plastic, they are harder and more stable than cardboard boxes, and they stack better. Carefully plan the order and pallet layout of the pallet and provide more protection using standard transport materials and packaging. The goods are loaded on pallets to protect the goods from any wear, puncture and extrusion damage that may occur during transportation. Pallet has different shapes and sizes, its width and height can be adjusted according to the special needs of the company, are designed for different purposes. When deciding on the right pallet, you should look at the shape, weight, and size of the products stored on the pallet. The Chinese pallet sizes are different, usually 800mm x 1200mm and 1000mm x 1200mm (120 cm x 100 cm, 120 cm x 80 cm). There are also many different designs that can be customized according to user requirements. Some pallet manufacturers can even tailor pallets to meet the needs of companies with very precise or unusual dimensions. What Material Is The Pallet Made Of? The pallet is made of many materials, such as wood, metal and plastic. Different materials are used to make various types of pallets. Each of these materials has its own advantages and disadvantages. Not all pallets look the same because they are all for different purposes. They are basically designed according to the weight or other specifications that need to be carried. The main and most common pallet types are described below. Wooden pallets are the most popular type, because of their durability, strength and price are very affordable. Wooden pallets are very cost effective. They can be very heavy and directly increase the cost of air freight. As the number of uses increases, they also tend to shrink, warp, and have problems with fungi, nails and debris, pests and insects. They are also difficult to deal with, so they are increasingly being replaced by plastic pallets. The plastic pallet is another pallet that is formed of synthetic resin by an injection-molding technique. There are different types of plastic pallets, and their cost and durability vary. They can be reused without any special care and maintenance, and provide non-slip surfaces and high load capacity. In general, plastic pallets are often quite rugged and can be used repeatedly for transportation, and they will not rupture or fear sharp objects. They are suitable for use in storage. But, once cracked or cracked, it is often difficult to repair. Cardboard pallets are fragile and therefore not suitable for various applications. It is newer on the market. Both types of pallets are made of structural-enhanced materials that are lightweight, recyclable and inexpensive, and are typically used for lighter loads. They can withstand heavy loads, apply to the transport of heavy-duty goods, marine storage, and long-term outdoor storage. Because they are stronger than plastic and wood, do not decay. We do not worry about residual plastic or wooden pallet debris residue, nor fragmentation, they are most often used to store and/or transport particularly large or heavy cargo. However, compared to other pallets, the metal tray itself is usually very heavy and more expensive. For its cost and corrosion resistance, steel pallets are not often used in transport. There are several types of pallets to choose from, and the type you choose will depend on these factors, especially the use and affordability of the pallet. The larger the product the heavier, the more structure and strength needed to keep the product. Plastic trays are increasingly popular because of their recyclable, insulated, lightweight and environmentally friendly. In addition, they are not subject to insect infection. On the other hand, cardboard pallets are fragile and metal pallets are too heavy to be used for a variety of applications. These pallets are made from reliable materials and are not broken and used for long term. A more reusable pallet can help you achieve durable solutions that minimize operational costs. 2. Plastic Pallets Are Easier To Handle And Easy To Store. The design of plastic pallet is suitable for all kinds of handling and handling. Not only are they lighter, but plastics can also be molded to form better human-use designs. Some plastic trays even include handles to facilitate carrying. 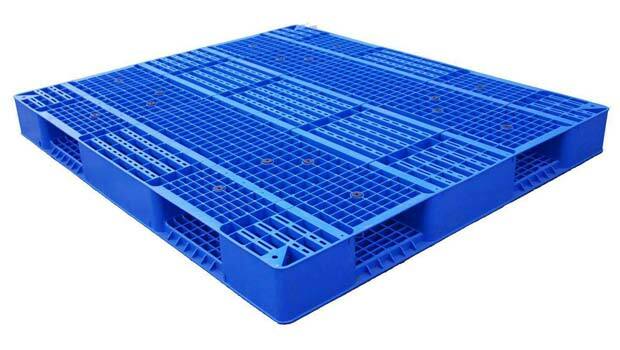 Most plastic trays have a convenient nesting design, and a pallet can be installed almost entirely on another pallet without taking up a lot of space. With smooth surface, plastic pallet are easier to clean. When cleaning the pallet, all traces of dirt, stains and other contaminants can be quickly cleared, they will not leave any odor. The wooden pallet surface is difficult to clean Because it is very rough, dirt and liquids enter the rough surface. If your product is weighed on pallets for transport and customs purposes, this will have a negative impact on your logistics costs. Our mission is to provide individuals and businesses with a reliable logistics and delivery solution covering USA, Canada, North and South America, Australia, New Zealand, Nigeria, South Africa, Saudi Arabia and Middle East, UK, Spain, France, Germany, Portugal, Italy, Poland, Sweden and Denmark and others. Give us a few minutes and we'll give you a shipping quote. It's easy. Well, if you're interested, just fill out the online form and soon we'll provide you with a quote. PRO China Freight specializes in offering expert international freight forwarding services to business and individuals.